Model organisms have been essential tools for genetics research since the field was formed. Kelle Freel discussed the characteristics that make for a good model organism in a previous TME post. Briefly, traits like short generation time, lots of offspring, and easy-to-track developmental stages have been exploited to answer questions about molecular mechanisms behind transmission, cyto-, developmental, population and quantitative genetics and comparative genomics. A lesser-known model organism is the three spined stickleback, Gasterosteus aculeatus (though it has been mentioned or discussed in several previous TME posts). Why? Because this fish has the rare honor of being an evolutionary and ecological model organism. Sticklebacks occur holarctically in marine, estuarine, and freshwater (freshwater) habitats in Europe, Asia, and North America. During the last retreat of the glaciers in the Pleistocene, this historically marine species began to invade freshwater habitats many times on different timescales in different places. What piqued researchers’ interests about these fish, in the pre-genomic age, was the striking phenotypic variation in various newly-formed freshwater populations and how quickly these divergences happened. Even though freshwater morphs can differ markedly from each other, even in the same lake, there are certain morphological changes that consistently happen in the evolution from marine/anadromous to freshwater forms, like the loss of body armor. Fig 1 from Cresko et al 2004. A-C) are freshwater-derived representatives while D) is an anadromous specimen. This in situ replication lends itself to the study of adaptive radiation and parallel evolution in the wild – a rare treat for evolutionary biologists. Furthermore, scientists have been able to perform genetic crosses between different morphs and produce viable offspring. By coupling laboratory crosses between divergent phenotypes with genomic information such as SNP locations across the genome (i.e. QTL mapping) previous studies (reviewed here) managed to pin down regions of the genome likely responsible for a wealth of phenotypic differences observed between environments like body size, feeding traits, and color. 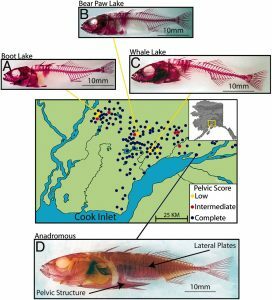 Again, technology lurches forward and in 2010, the first high density SNP-based genome scan (45000 SNPs, 100 fish) of sticklebacks was undertaken. Applying those observations of intrapopulation diversity and interpopulation divergence patterns to hypotheses of evolution and adaptation the researchers found: 1) the repeated parallel evolution observed in this system relies upon “freshwater haplotypes” that nevertheless persist in oceanic populations at low frequencies, then become frequent in newly minted freshwater populations (aka parallel hard sweeps), as opposed to new mutations cropping up over and over in replicated freshwater populations; 2) both balancing and divergent selection play a role in stickleback evolution; 3) many of the genomic regions previously identified as having a QTL related to divergent phenotypes overlap with regions they found to have high FST values, and that newly-detected regions of the genome also contain patterns of divergence between populations; 4) their results lend more evidence to the biogeographic hypothesis that a large, panmictic oceanic population has repeatedly given rise to divergent freshwater populations. Fast forward to the July issue of Genetics and the newest installment of RAD-seq/SNP discovery/stickleback research. What novel insights are to be gained? 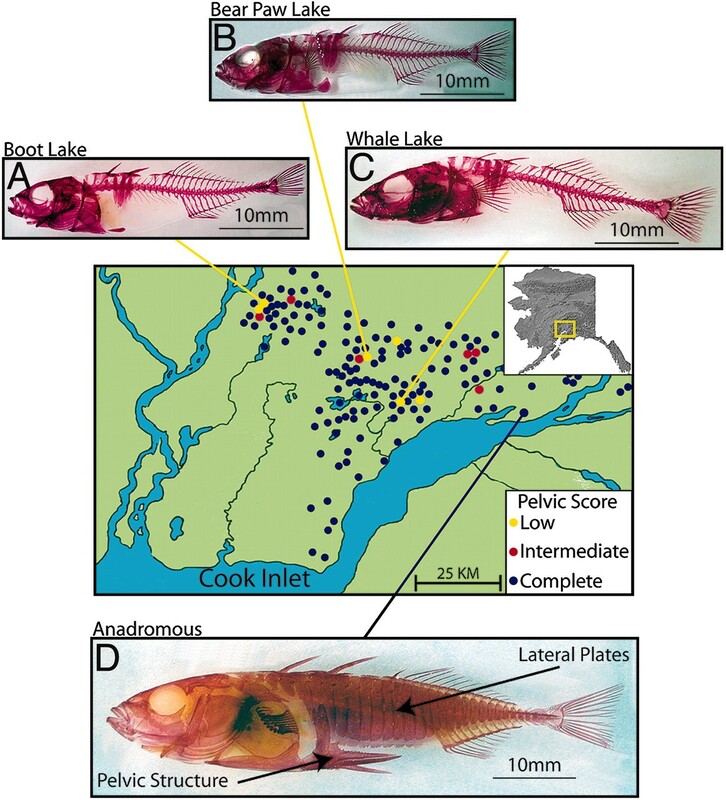 First of all, the authors were able to take advantage of a quite recent colonization event of freshwater habitat via the 1964 Alaska earthquake, which was so powerful that three islands were seismically uplifted, trapping some sticklebacks in newly-formed freshwater ponds. Secondly, by training a general Hidden Markov model to segment the genome into regions of high and low divergence using genomic data from regions of known high and low FST values from other studies, and defining and classifying haplotypes (~100bp RAD loci, instead of individual SNPs) into different categories and analyzing the pattern between regions of high and low divergence across freshwater and marine populations, they were able to gain insight into mechanisms of evolution absent in other studies. Fig 2 from Bassham et al 2018. I-XXI are linkage groups of the stickleback genome. Each concentric circle, numbered outward, is a pairwise comparison of FST’ values. “OC” indicates a marine population. The complete lack of high FST’ (red; a measure of haplotype diversity) in ring 1 illustrates the low haplotype divergence between two oceanic populations. 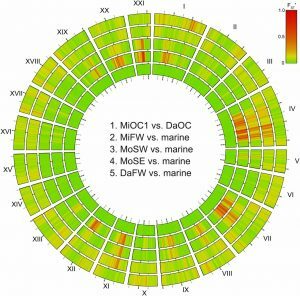 Rings 2-5 are comparisons between a newly-formed freshwater population and 3 pooled marine populations. Note that regions with high FST’ values overlap across comparisons. Rings 4 and 5 represent the youngest of the populations and so have less marine-freshwater divergence. For example, marine sticklebacks have lower absolute haplotype diversity across divergent regions as opposed to non-divergent regions, which underscores the possibility of strong selection in both regimes, not just freshwater. Furthermore, most haplotypes in majority in freshwater occur in marine fish as well, but are rare. Therefore, greater purifying selection in marine sticklebacks across divergent genomic regions coupled with the fact that haplotypes that are more successful in freshwater habitats persist in marine fish at low frequencies could contribute to the magnitude of the divergence the authors observe as well as the speed with which freshwater morphotypes arise from oceanic stickleback when they colonize a new freshwater habitat. In fact, both population types could be acting as reservoirs of genetic diversity. Another striking finding was the percentage of the genome deemed to be divergent, nearly 25%, which is a 30-fold increase from previous estimations. However, the authors argue deeper population genomic sampling will detect more changes in allele frequencies across loci as compared to previous methods. So to reiterate: The remarkable thing about this system is that A) there is a powerful signal of divergent selection, more powerful than previously assumed, even in the presence of gene flow and B) this parallel evolution phenomenon has happened over and over, in the same regions in the genome, in a time period as short as 50 years, though the evolutionary history is much deeper. Truly, the stickleback is a fascinating and powerful evolutionary and ecological model organism. This entry was posted in adaptation, evolution, genomics, natural history, selection, stickleback and tagged adaptation, gene flow, natural selection, selection, stickleback. Bookmark the permalink.